District 1 – Uniontown is the District 1 champion as the only team that can match the Eagles’ 4-1 district record is Marais des Cygnes Valley. The Eagles beat MdCV 80-40 in Week 7. Marais des Cygnes Valley is the district runner-up. Even if the Trojans lose to Pleasanton this week an end in a two or three-way tie with St. Paul and Waverly, MdCV has head-to-head wins over both the Indians and Bulldogs. District 2 – West Elk will travel to Central Burden this week with the winner advancing to the playoffs as District 2 champions, while the loser qualifies as the runner-up. District 3 – Burlingame is the District 3 champion as the Bearcats have won their first four district games including a 48-26 win over Rural Vista in Week 6. The Heat have clinched the runner-up spot with wins over Peabody-Burns and Lebo; the only two teams that could finish in a tie with them in the district standings. District 4 – Hanover is the District 4 champion with five district wins thus far. Mankato-Rock Hills can qualify as the runner-up with a win at Clifton-Clyde this week. The Grizzlies hold the head-to-head advantage over Osborne and Wakefield; the two teams that could tie them in the standings. Wakefield must root for Clifton-Clyde to upset Rock Hills as that’s the only way the Bombers can make the playoffs. District 5 – Central Plains clinched the district title with a 46-14 win over Solomon last week. Solomon can grab the runner-up spot with a win at Little River this week. Little River can qualify as the runner-up if the Redskins beat Solomon and Ellinwood loses to Canton-Galva. If Ellinwood wins by at least 21 points and Solomon loses to Little River by at least 21, the Eagles could tie the Gorillas in the standings for the runner-up spot. In that scenario, Solomon would go to the playoffs by virtue of its 46-20 win over Ellinwood in Week 5. Thus Ellinwood has been eliminated. District 6 – South Central has won the District 6 championship and qualified for the playoffs for the third consecutive season. Kiowa County has clinched the runner-up spot with wins over Kinsley and Pratt-Skyline; the only two teams that could finish in a tie with them in the district standings. District 7 – Spearville is the district champion after last week’s 46-0 win over previously-unbeaten Hodgeman County. Despite the loss the Longhorns are going to the playoffs as the District 7 runners-up regardless of their result against Ness City this week. Hodgeman County defeated both Dighton-Healy and WaKeeney-Trego in district play. The winner of the Hornets and Golden Eagles could tie the Longhorns in the district standings, but Hodgeman County qualifies based on the head-to-head advantage. District 8 – St. Francis has clinched a playoff spot out of District 8. Even if the Indians lose to Logan-Palco this week they will finish in the top two in terms of the district points tie-breaker in the event of a three-team tie. If the Indians beat the Trojans they will clinch the district title and a first-round playoff date with Hodgeman County. Atwood-Rawlins County can clinch a playoff spot by beating winless Quinter this week. Logan-Palco began the season with six straight wins and sits at 7-1, but the Trojans need to beat undefeated St. Francis and hope that Quinter pulls off a massive upset of Atwood-Rawlins County. Even if the Trojans beat St. Francis, they’ll be the odd team out of the playoffs due to the district points tie-breaker if Atwood-Rawlins County beats Quinter. The Trojans can only finish with +45 points, while Atwood-Rawlins County can finish no worse than +77 points with a win over Quinter. District 1 – Axtell is the district champion by virtue of a 22-0 win over Pike Valley Week 7. Pike Valley has qualified as the district runner-up with wins over Frankfort and Linn; the only two teams that could possibly finish in a tie with the Panthers in the district standings. District 2 – Chase (4-0) has clinched the District 2 title as the Kats hold the head-to-head tiebreak over Centre-Lost Springs (3-1) with a 56-6 win in Week 7. Centre-Lost Springs is the district runner-up as the Cougars hold the head-to-head tie-breaker with wins over both Wilson and Tescott. District 3 – Colony-Crest is the District 3 champion after a 56-46 win over Hartford in Week 6. The Jaguars are the only team that could tie the Lancers in the district standings. Hartford would clinch the runner-up playoff spot with a win over Chetopa this week. Chetopa can still clinch the second playoff spot, but the Green Hornets must beat Hartford by at least 19 points to get in. District 4 – Argonia-Attica hosts South Barber this week with the winner claiming the District 4 championship. This is a rare circumstance where South Barber can win the district title with a win this week, or miss the playoffs completely if they lose. That depends on the results of the other district games featuring South Haven at Pretty Prairie and Norwich at Caldwell. 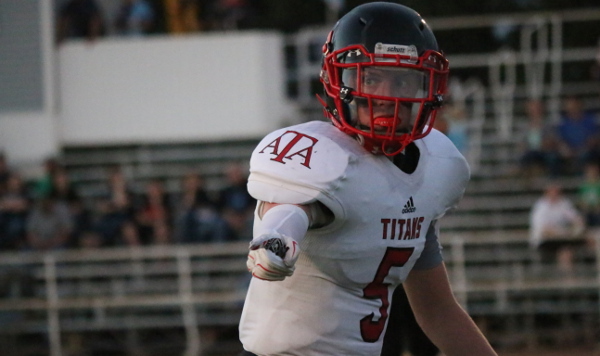 Pretty Prairie and Caldwell each need to win and hope Argonia-Attica beats South Barber. Should a three-way tie occur for second place, the team with the most district points will get the runner-up playoff spot. District 5 –Minneola can win the district title with a win over Stafford this week. The Trojans would need to beat Minneola by at least 21 in order to force a three-way tie in the standings and in the district points tie-breaker. If the three teams end deadlocked in the standings and points system, Ashland and Minneola appear to be in the best shape given their overall number of wins and winning percentage are better than Stafford’s. District 6 – Ingalls has clinched the district title by virtue of a 80-56 win over Satanta back in Week 6. Satanta can clinch the runner-up spot with a win over Deerfield. A Deerfield win coupled with a Moscow loss to Rolla would put the Spartans in the playoffs. Should Deerfield beat Satanta and Moscow beat Rolla, a three-way tie for the runner-up spot would occur and the team with the most district points would qualify as the runner-up. District 7 – Victoria and Otis-Bison have clinched the two playoff spots out of District 7. The Knights and Cougars meet this week in Otis to determine the district championship. The winner qualifies as the champion and the loser as the runner-up. District 8 – Sharon Springs-Wallace County has clinched the district championship by virtue of a win over Triplains-Brewster, 24-6 in Week 5. Triplains-Brewster is the runner-up as the Titans hold the head-to-head tie-breaker with wins over both Hoxie and Tribune-Greeley County.